Is Your Sales Team Targeting the Right Accounts? If your sales team is approaching customers that aren’t suited for innovation, deadly sin #4, then selling innovation is going to be extremely difficult. Let’s imagine you have a new, innovative golf swing approach. Right now, would you approach Jordan Spieth, the reigning Masters champion, with this new golf swing? (Last week was the Masters so golf is still on my mind!). You can provide a swing technique you believe will take him to the next level, and he’s a golfer, so you just assumed that he would be a good target to approach, right? Wrong. He just became the second youngest player to win the Masters, setting multiple course records and matching Tiger Woods for the lowest tournament score in its 81 year history. Have there been in changes/pressures in the customer’s industry that would cause them to need to innovate? Is the customer producing any new products or will they produce any new products in the near future? Are there any new business models you are seeing in their organization? Are there any opportunities to innovate within the customer’s processes, services or organizational structure? You sales team must be curious in order to find out the current make-up of their customers and determine whether or not innovation is right for them. Curiosity is a pre-condition for innovation, and lacking this pre-condition is where we find the fifth sin. 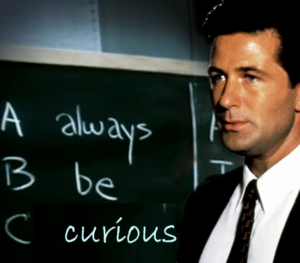 In the clichéd “ABC” reference in the film Glengarry Glen Ross, a young and dapper Alec Baldwin tells a sales team to “Always Be Closing”. I disagree. This persistent mentality can alienate potential customers and end a sales conversation before it even starts. Let’s switch the mindset to “Always Be Curious”. Questions should be the backbone of every conversation and their answers the drive behind every action. After all, the right questions lead to exploration which leads to the potential for innovation, as examined earlier. When you stop asking questions and dominate the conversation with talk about your products and capabilities, the customer may feel as though you are pressuring them to buy, and BUY NOW. The customer, now feeling under attack, becomes discouraged to the conversation and the sale is lost. Instead of trying to close the customer, try understanding the customer first. Rather than seeing the customer as someone to be conquered, see them as a fellow explorer and collaborate together to identify their problems and ways to meet their needs. Focus on a desire to understand what drives your customer and how their business operates. Prioritize this desire of understanding over your desire to conquer them and chalk up another sale on your resume. Forget always be closing. Let’s Always Be Curious. Selling innovation should be easy, but it isn’t; especially if you commit even a single of the 7 deadly sins.